Did you know that you can receive your social security payments in almost every country in the world—and even have it directly deposited into your local bank account in over 65 of those countries? According to the latest figures from the U.S. Social Security Administration, U.S. retirees overseas received more than $3 billion in social security payments in 2013—an increase of $160 million since 2012. Free Report: Learn about the best places in the world to retire in our daily postcard e-letter. In total, 373,224 U.S. retirees received their social security payments as residents of a foreign country in 2013. Europe is home to the most U.S. retirees drawing their social security payments abroad (154,238), followed by Canada and Mexico (95,767), and Asia (70,586). You can have your social security payments direct deposited into your account in 69 countries, including Argentina, Belize, Colombia, Mexico, Malta, and Panama. The SSA will not send checks to North Korea, Cambodia, Vietnam, or some areas of the former Soviet Union (other than Armenia, Estonia, Latvia, Lithuania, and Russia). 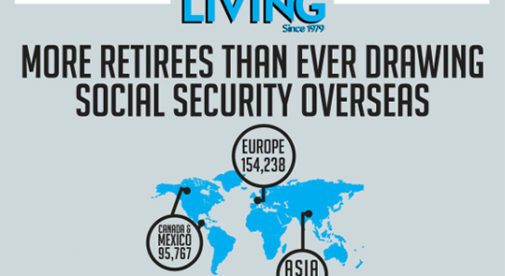 Since 2003, the number of retirees receiving their social security overseas has increased from 248,012 to 373,224. The number of retirees drawing their benefits in the Philippines has increased from 8,371 to 16,808, with those drawing in Panama growing from 579 to 1,870, and from 1,614 to 2,836 in Ecuador. Generally, your retiree benefits will not be taxed by the U.S. if they are your sole source of income. If your total income exceeds $25,000 (if single) or $32,000 (if married and filing jointly) a year, then a percentage of your earnings could be taxed. However you could be eligible for a $100,800 exclusion on your income tax if you qualify for the foreign earned income exclusion (FEIE). Living overseas in countries with low cost of living—like Panama, Ecuador, Costa Rica, and Nicaragua—can really stretch the value of your retiree benefits and improve the quality of your retirement. The number of American retirees living abroad is likely higher than what the security payments reflect. Many retirees keep their U.S. bank account when living overseas and simply continue to bank in the U.S even though they may not be physically present there year-round. In many places banking locally when overseas can save you money by avoiding the many fees banks charge for the use of a foreign ATM—these can include on-bank ATM usage fees, ATM operator access fees, and international transaction fees for conversion to U.S. dollars. Some banks will charge you ATM withdraw fees as high as $5 if you don’t bank with any of their affiliate banks, as well as hefty transaction fees on your withdrawals.